1.2 Mile Distance Swim Challenge RECAP! | Keep It Up, David! My nerves were probably completely unwarranted, but they were there anyway. I’m a very strong swimmer. We had a pool in the backyard growing up, and my parents introduced me to the water when I was a toddler, if not younger. I competed on teams from elementary school through 10th grade. I’ve swum distances longer than this event, without stopping. I was ready. And yet ocean swimming is a whole different beast. I only trained once in the ocean in preparation for this event, and there was still a lot that I was rather inexperienced with – things like currents and waves, and swimming towards a destination without lane lines or painted stripes on the bottom of the pool. Plus, there were sharks in the ocean. When I signed up for the Distance Swim Challenge way back at the beginning of the summer, I laughed at the thought of sharks. Shark attacks are extremely rare, and most aren’t fatal. But, in the past week, sharks have come up again and again and again. 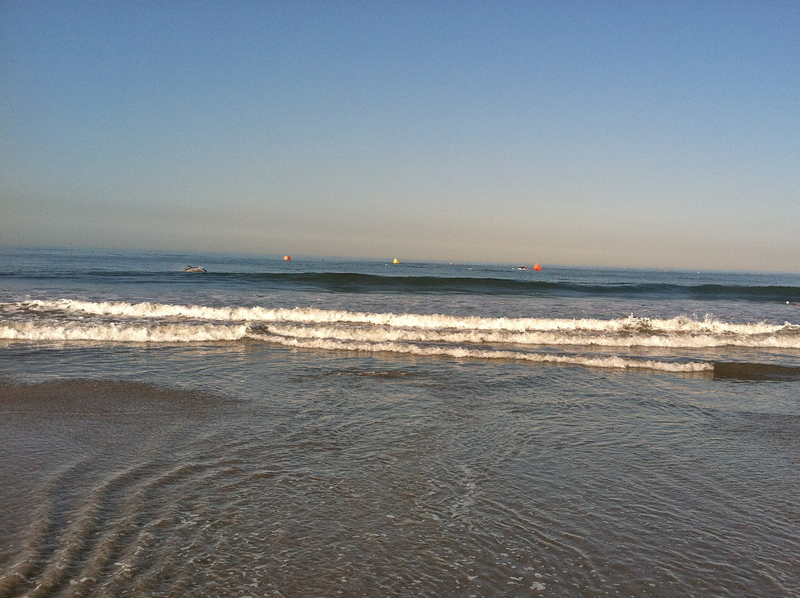 Ten days ago, an 18-foot great white shark was spotted off of Venice Beach – in exactly the waters where I’d be swimming. I’ve seen billboards and read an article about “Jaws” was finally coming out on Blu-Ray – it’s one of my favorite movies, and one that terrified me as a kid. A buddy at work told me about a great white shark iPhone app that tracks where sharks are at any given moment – I even bought the app, but got too scared to use it before the race (I didn’t want to know if there were sharks nearby). Then, above all else, last week was Shark Week on TV. In years past, I gobbled up Shark Week programming like it was a floundering sea lion, but this week, I stayed away entirely. That didn’t prevent my TiVo, which knows me oh-so-well, from recording programs it thought I might like – programs with names like “Great White Highway”, “Jaws of the Pacific”, and “Top 10 Open Water Swim Shark Attacks.” I may be exaggerating with that last title, but not by much. My nerves went away pretty quickly, though, once I saw the set-up. This event was well organized. I was swimming in the 1.2-mile race, and that was the shortest event. 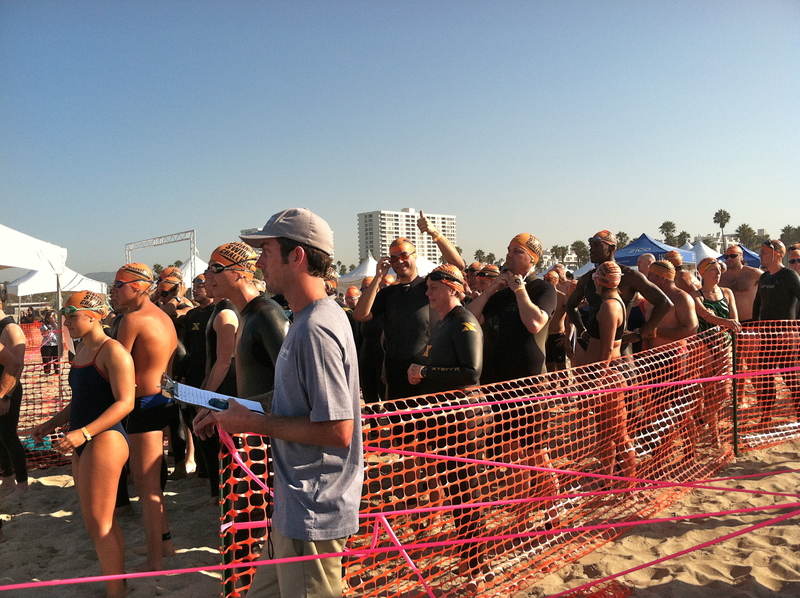 Other swimmers were competing in races totaling 2.4 miles, 4.8 miles, 10 kilometers, and 12.6 miles. 12.6 miles – that’s a lengthy drive, let alone swim! 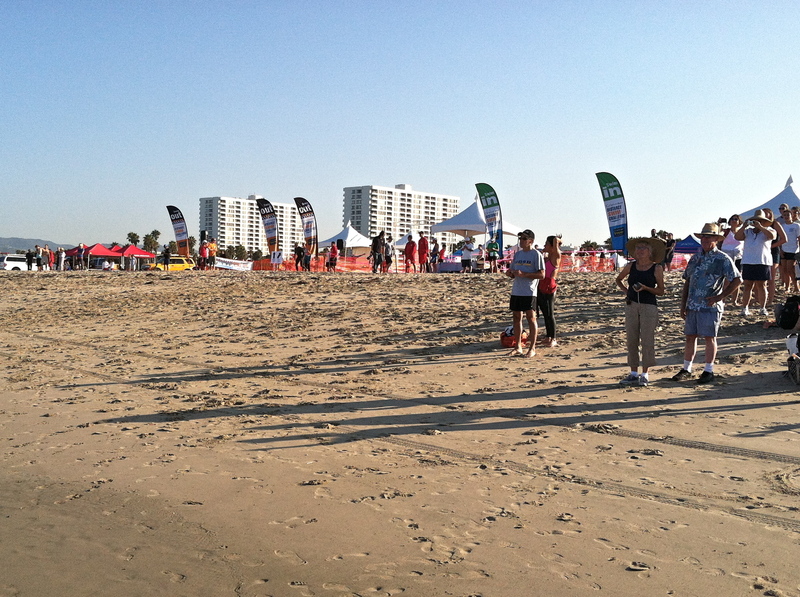 In addition to being the starting and ending point for the 1.2 mile swim, this part of the beach was a checkpoint for the longer races – swimmers exit the ocean every few miles for hydration and a medical check. My friend Heidi came with me (for support and to also serve as documentarian – something she’s done before), and before my race started, we watched swimmers in the longer events pass through the checkpoint. 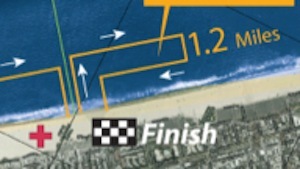 The starting line is on the beach, and when the horn sounds, you head into the water and out to the yellow buoy (center arrow). Then you hang a right and swim down the beach for a half mile, before turning around and heading back. 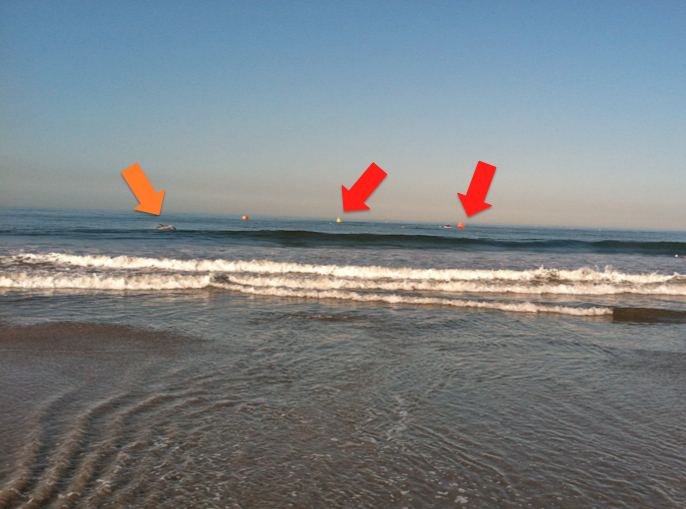 When you reach the orange buoy (the right arrow), you turn in and head for shore. 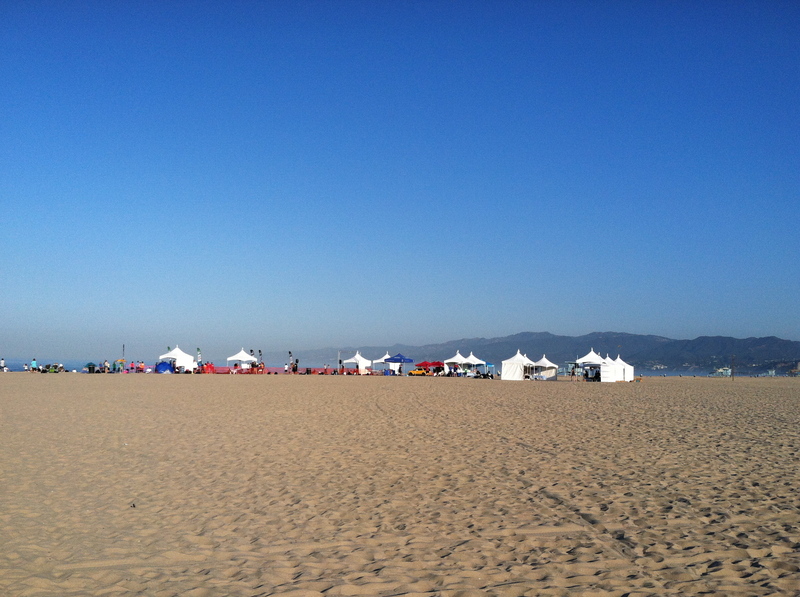 The finish line is right next to the starting line, on the beach. 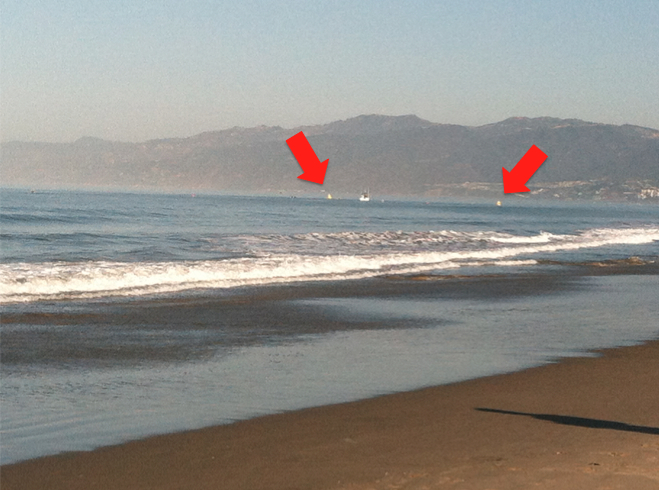 I could also see the far buoys, half a mile down the beach. They didn’t seem that far from where I was standing, but I knew that’d be different once I was in the water. In addition to the buoys, there were a lot of people on the water. Lifeguards on boats. Lifeguards on jet skis. Lifeguards on paddleboards. Someone parasailing above to get a bird’s eye view. All this helped calm my nerves, and soon enough, it was time to get into starting position. 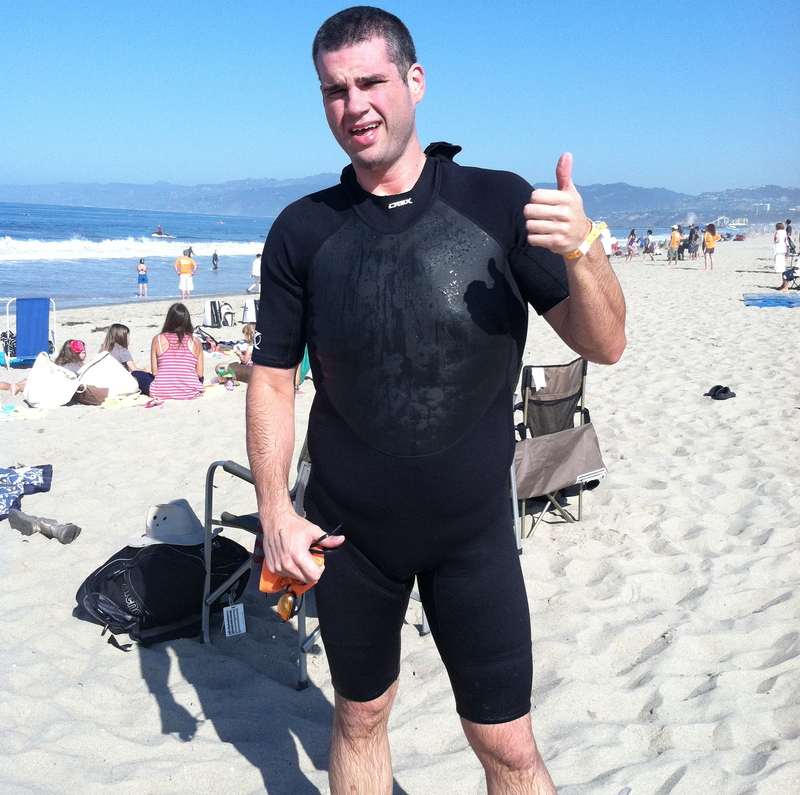 I put my wetsuit on at home, so once I put on my cap and goggles, I was good to go! I also had a timing chip strapped to my ankle and they marked my hand with my race number – I was swimmer #111. I had gone down and walked in the water a little bit prior, but I didn’t get in above my ankles. 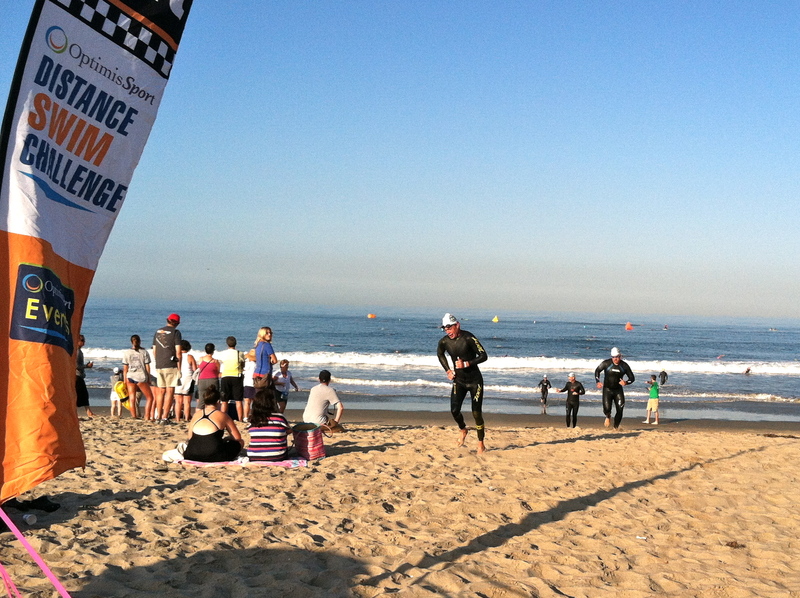 When I splashed my way in during the actual race, I was immediately reminded of something that I already knew: the ocean was cold. They were saying water temperature was around 68-70 degrees, but I didn’t buy it. Seemed colder than that. I got used to it quickly, thanks to my wetsuit and the fact that I was moving, and it didn’t take long for me to realize that I was moving fast. That first leg – straight out to the first buoy – was the toughest, because I was fighting the waves coming to shore. I went out a little too hard, because by the time I swam around that first buoy, I was exhausted. And I had only swum about 1/12th of the race! I slowed my pace and kept swimming, but then realized I had a much bigger problem: All of a sudden there were no other swimmers near me, and I had no idea where I was going. Imagine you’re in a giant parking lot. Asphalt in all directions as far as the eye can see. Now imagine you have to walk towards a 7-foot-tall marker that’s half a mile away. Now imagine, instead of walking, that you’re lying on your stomach on the asphalt, and the asphalt is slowly undulating and swelling. That’s exactly how I felt. Sure, the shore was on one side of me, but it was a good ways away, and didn’t provide much help. I knew I had to swim north to the next buoy, which I couldn’t see, so I swam north. Until a lifeguard on a paddleboard caught my eye when I took a breath, and told me I was off course – I had been veering farther out to sea. Whoops. So I reoriented myself, and swam with my head up for 50 or 75 yards, trying to spot that goddamn buoy. I finally saw it, had a moment of relief, stuck my head back into the water, and swam, good and hard, despite my tiredness, plowing through the water. I kept my head down for, I don’t know, 100 yards, before looking up again and realizing I was facing the wrong way entirely. I had just swum a big half circle. Double whoops and CRAP. I turned around, and finally settled into a rhythm where every fourth stroke I would lift my head just enough to see ahead of me. I couldn’t always see the buoy, so I would look for Santa Monica Pier, which was farther in the distance and very easy to spot, because of its roller coaster and ferris wheel. I found a pace that challenged me but didn’t completely exhaust me, and, over what seemed like a very long period, the buoy slowly got closer and closer, until I finally rounded it. Halfway done. The third buoy was very close to the second, and after rounding that, I settled into the second longest leg of the event. This leg was easier, because I was entrenched in my rhythm and familiar with the tug of the current. 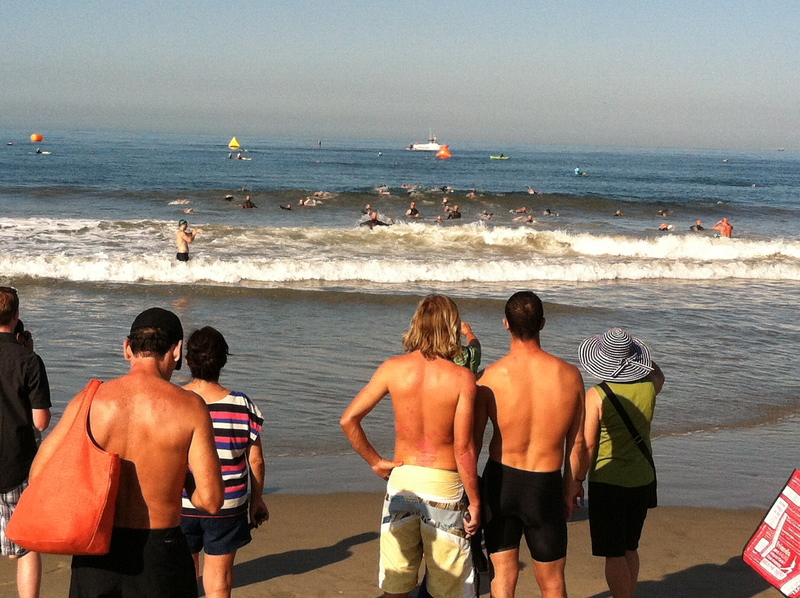 Plus, some other swimmers had caught up to me, and it was easier to keep an eye on them for reference than the buoy. I kept pushing myself through the water, encouraging myself to reach farther and kick harder. I started feeling the urge to throw up. By the time I reached the orange buoy and turned towards the shore, I felt like I was running on empty. I could’ve coasted onto the beach – after all, the waves were pushing me already – but I couldn’t end this event by coasting. I summoned whatever energy I had left and sprinted. When it was shallow enough to stand and only be in waist-high water, I stood. And I ran to the finish line. I have no idea what my time was – I’m still waiting for official results (I’ll update this when I have more info). My heat started on time, and based on her clock, Heidi thinks I finished in about 37 minutes. If that’s true, than I’ll be elated – the goal I established with my sister last week was to finish in under 40 minutes. But who am I kidding? I’m elated anyway. Because I finished a 1.2-mile open water swim! **UPDATE** OFFICIAL TIMES ARE IN! I finished in 36 minutes, 37.7 seconds – 18th place! (Out of 62 finishers) And, I was 2nd place in my division! (Non-USMS Men, ages 30-34) (out of 8 finishers) I was only 4 seconds from winning my division altogether. FOUR SECONDS! After sitting down for a little while, Heidi and I headed over to the expo area, where I ate some fruit and part of a bagel, and picked up a coconut water. On the way home, I reset my trip odometer to see exactly what 1.2 miles was. It was far. Farther than I would’ve guessed. And I just swam it, in the largest, deepest body of water on the planet, without stopping. 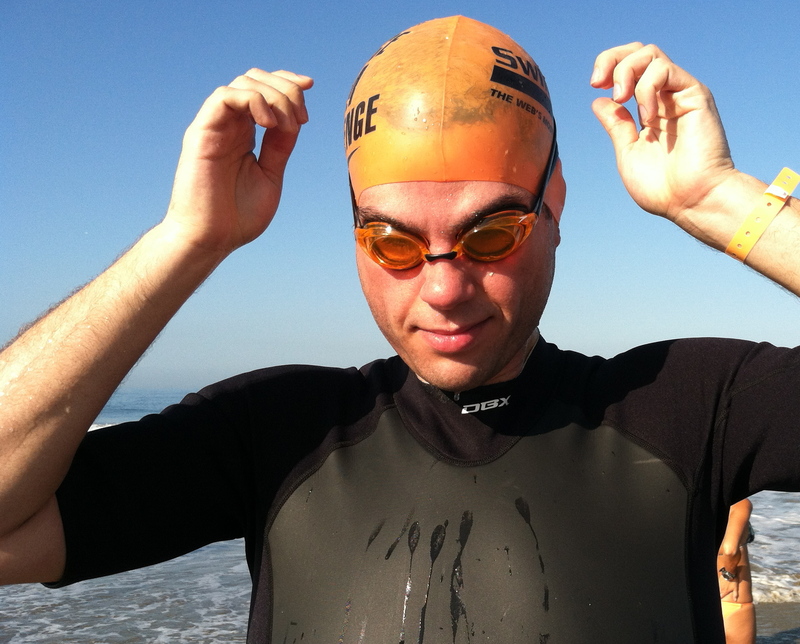 This open water swim was the seventh fitness challenge I’ve completed in the past year (see the others on this page, which will soon also feature this race), and the one I was most nervous for. Now it’s the one I’m most proud of, mainly because of my nerves. I conquered my fears to finish this race, and that’s always an amazing feeling. 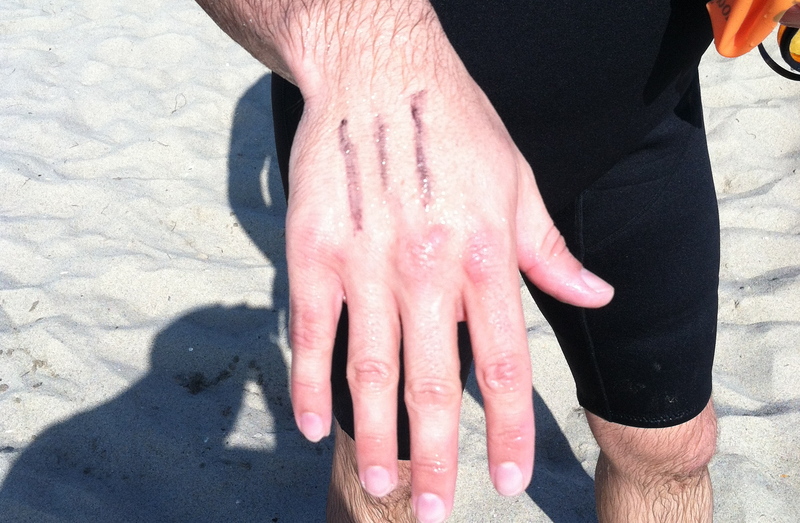 Plus, as a bonus, I exited the water with the same number of limbs that I entered with, so screw you sharks! Better luck next time. 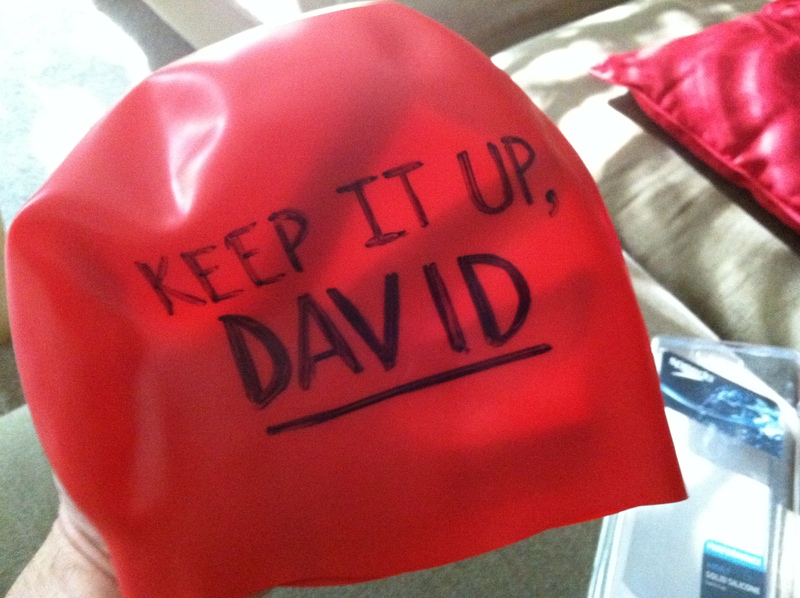 Finally, it didn’t occur to me that I’d be getting a swim cap when I checked in at the race, so I bought one the other day, and decorated it with the same message that I use to end every one of my posts. I didn’t end up using it, but it’s a fitting way to wrap this post up. This entry was posted on Sunday, August 19th, 2012 at 10:55 pm and is filed under Uncategorized. You can follow any responses to this entry through the RSS 2.0 feed. You can leave a response, or trackback from your own site. 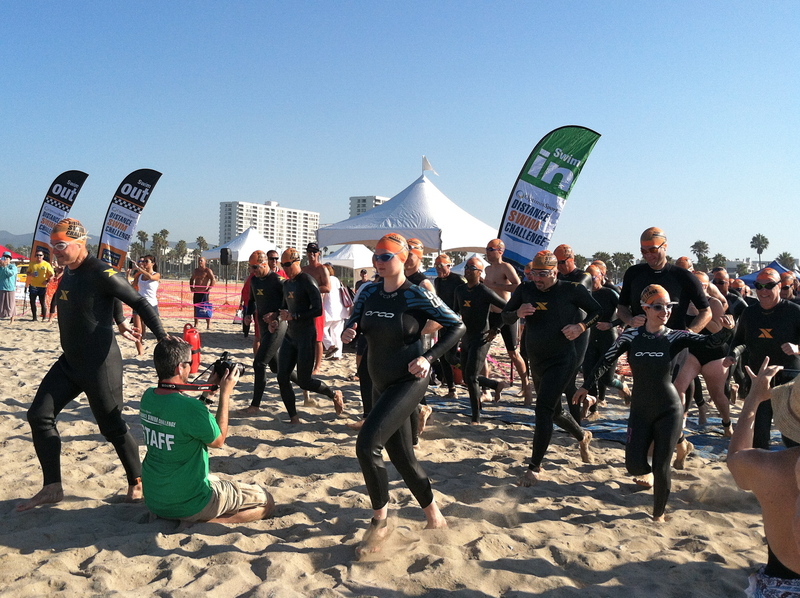 10 Responses to 1.2 Mile Distance Swim Challenge RECAP! I’m SO proud of you, David, for meeting your fears, accomplishing your goals, and for keeping all your limbs! Hip Hip Hip Hooray! Hip Hip Hooray! Way to go David! Congratulations! I wish I were there! 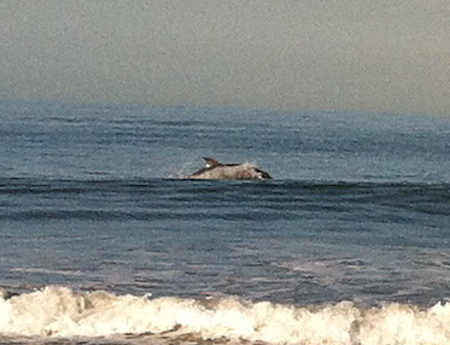 Dolphins are a great omen! Agree with everyone above. Tremendous personal achievement! You’re one brave man. The dolphins were a good signal that all was well, no sharks. I felt positively gleeful reading your post! What a fun day and all for good. Yay! CONGRATS! Was that a dolphin or an airborne shark? Hi there David! I just nominated you for inspiring blog award. Here is a link to instructions on what to do next. Finally just got to reading this particular post… So proud of you! Loved reading about it! Keep it up!! After hearing about this the other night, this was a very enjoyable read, with much more detail. Nicely done!